What's an advisory bicycle lane? Also called a "non-compulsory bicycle lane” or "suggestion lane” (translated from the Dutch "suggestiestrook”), it’s a bicycle lane into which motor vehicles may legally encroach. Therefore, the line demarcating the lane is dashed instead of solid. 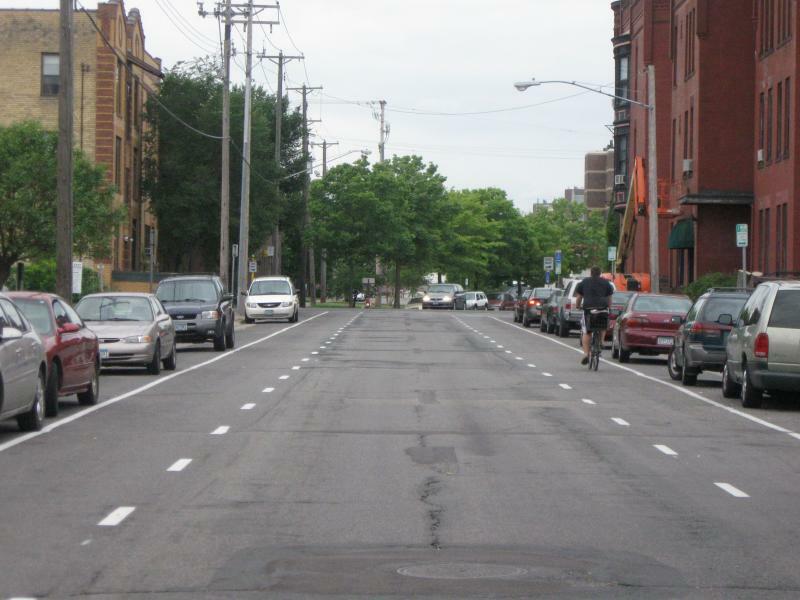 An advisory bicycle lane is often—but not always—used in conjunction with centerline removal. Generally, a mandatory bicycle lane is preferable; an advisory bicycle lane should only be used when a mandatory lane cannot be used. Advisory bicycle lanes should be considered 1) when street width is inadequate for mandatory bike lanes or 2) where cars are likely to encroach on a bike lane as it approaches a bike box. Advisory bike lanes should not be used where they are likely to be blocked by parked motor vehicles. Advisory bike lanes in conjunction with centerline removal on roads with substandard width are common across Europe and are generally well received by cyclists. A year ago, we suggested THIS opportunity for Newark's Main Street (probably lost now). It's time to move past talking about shared lanes to actually implementing them, even if on a FHWA experimental basis. As it stands now, the MUTCD forbids any kind of delineated bicycle lane within a normal vehicle lane; data from the field is needed over a long period before these are approved in the manuals. I've been following this issue, and still see a lot of discontent, as well as the still-existing disconnect between residents, officials, and developers. It's still a hot-button topic, with no real way to work through it. At this point, we're just an occasional voice, with no one place to hear or make ourselves heard or to meet and talk. So I've scheduled weekly meetings at the Newark Senior Center to try to help us work through the concerns that we all still have. It's open and available to residents, to our representatives in NCC and Dover, to the developers, and to any other interested parties. So please, come and feel free to vent against, defend, and say what's on your mind. It can only help. My interest: I'm a likely candidate for our State Representative District 24 for the election in November 2018. But, I'm also a resident at Chestnut Hill Estates, and use Ogletown Rd almost every day. I still see a lot of concerns about this issue from many sides. I strongly feel group sessions where we can gather can only be productive, and can help all of us get through the next year. So please pass the word around to anyone of interest. Thanks, and hope to see you Thursday.